Have you ever wondered how some retailers can amass so many quality reviews for their products? Their products must be so phenomenal that their purchasers are so compelled to write a review, right? While we're hopeful this is true for a portion of products, we're certain this is not true for the vast majority. 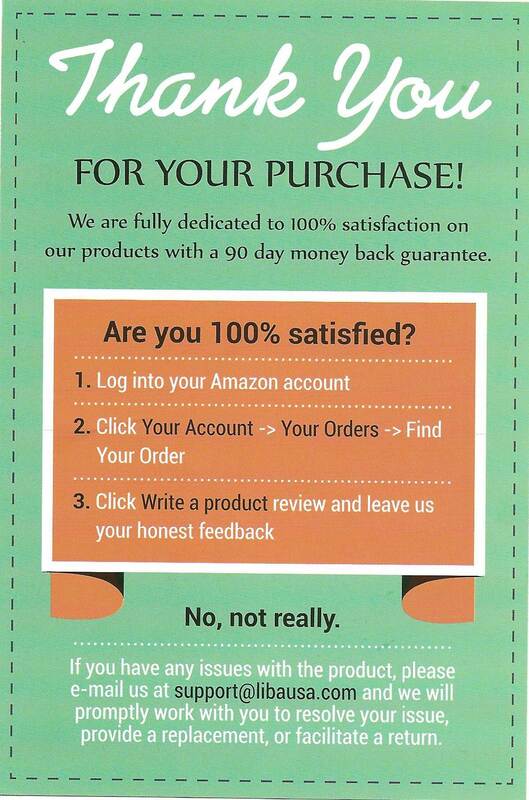 We are fully dedicated to 100% satisfaction with a 90 day money back guarantee. If you have any issues with the product, please e-mail us at [email protected] and we will promptly work with you to resolve your issue, provide a replacement, or facilitate a return. This is a textbook example of how to collect category-leading reviews through an actionable unboxing experience. The flip side of this insert invites the customer to join a loyalty program for early access to new products, discounts and monthly contests. The simplicity behind the piece is perfect, the call-to-action clear and the sincerity for customer satisfaction is apparent. Just like there are the good examples, you've likely also seen bad examples like those which outright asking for a five-star review and/or offer an incentive. As those practices violate guidelines set by the FTC use tactics like this packing insert, or approaching repeat customers, or those who frequently engage on social media above the more immediate, higher-risk ways (which can also get you kicked off Amazon). What are ways you're growing your product reviews? We'd love to hear and would be happy to provide you with advice, just let us know!